The Philippine National Police Director General Ronald 'Bato' dela Rosa admitted that there's an error on the list of names that our president announced on Sunday. PNP chief explain why there's an error on the 150 names of politicians, police and military officers and judges who allegedly involved on illegal drugs. PNP chief acknowledged those errors in the list of names and said, "It wasn’t just gossip whispered to the President … or those who didn’t support in the elections. The President is not that shallow." "Why are we so concerned about the mistakes? We should be concerned on the good effects of this massive campaign. If we allow ourselves to be controlled by the fear of making mistakes, by a small percentage, this campaign will go nowhere," PNP chief said. "To tell you frankly, we won’t be able to pin them down, because drug lords are very hard to pin down unless you have a comprehensive case buildup. But even if we don’t pin them down, and they keep on denying, at least the people know who they are, and they have promised to change," he added. The errors was one of the judge was found to be long dead, then the one classified as a 'congressman' was never a legislator. Of the four military personnel, retired Brig. Gen. Leoncio Daniega had already been dead since 2010, while the rest had already been long discharged from the service. According to Inquirer, a total of 58 who came to Camp Crame on Monday, 31 were police officers and 27 were local government officials. But they weren’t surrendering but simply wanted to clear their names. "The local government officials were referred to the Criminal Investigation and Detection Group for custodial investigation, while the officers will be investigated by the Internal Affairs Service," said to the report by Inquirer. What do you think of those errors found in the President's list? Please share your thoughts below. 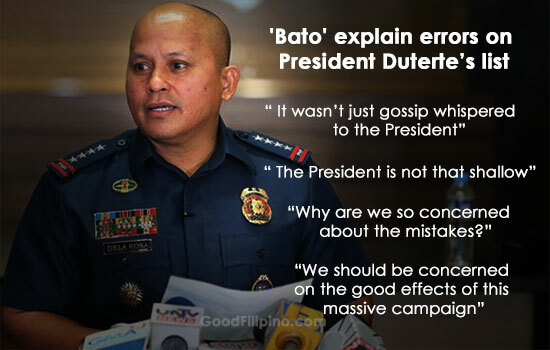 Comments or suggestions about "PNP chief 'Bato' explain errors on President Duterte’s list of names" is important to us, you may share it by using the comment box below.